Eurocom Corporation (www.eurocom.com), a developer of long lifespan, fully upgradable High Performance Notebooks is launching the world's most powerful 11.6" notebook with 2GB of video memory in the on board NVIDIA GeForce GT 650M , up to 1TB of SATA3, hard or Solid State Drives and even supports 16GB of Dual Channel DDR3-1866. At the core of the Monster 1.0, users have an NVIDIA GeForce GT 650M to do their bidding, with 2GB of video memory, 384 cores, with the graphics clock running at 850 MHz this new graphics powerhouse is the ultimate mobile gaming and workstation machine. With Optimus support, the EUROCOM Monster can run for 410 minutes on one charge. The EUROCOM Monster 1.0 has an 11.6”, 1366 by 768 display, Eurocom gives customers the ability to choose between a matte or glossy option. Due to the HDMI 1.4a (with HDCP) output port and external VGA port, the Monster 1.0 can power large external displays up to 3840 x 2160 maximum digital resolution. “This is perfect for on the go gaming, video viewing and entertainment purposes” explains Bialic. 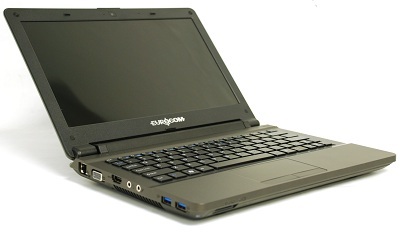 “EUROCOM Monster 1.0 provides gaming on the go graphics capabilities and high performance storage in an extremely small, under 4 pounds, lightweight notebook computer. This little Monster has the power of a full sized notebook, and has up to 410 minutes of battery life, it’s truly the best of both worlds” states Eurocom President, Mark Bialic. The EUROCOM Monster 1.0 is built with an ultra heavy duty design for unintentional abuse while on the go. It is a fully upgradeable system with support for the best in mobile technology. The Monster 1.0 can be customized based on processor, memory, storage, display and wireless technology. EUROCOM Monster 1.0 provides workstation calibre storage capabilities with 1 Terabytes of storage with a SATA-300 or SATA-600 Solid State, Hybrid or Hard Disk Drive. “With a massive 410 minute battery life, thanks to a 62.16WH battery and Optimus technology the EUROCOM Monster 1.0 is the perfect system for anyone on the go” states Mark Bialic.